If you're on the lookout for a glam Khaleeji abaya, I've just discovered some gorgeous designs over at Abaya Couture blog. 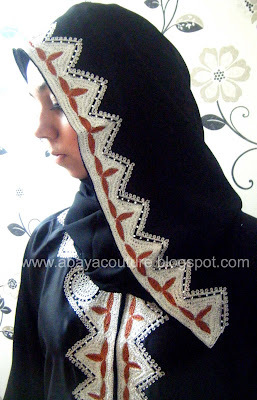 Based here in the UK, the abayas are made in Qatar and the owner is selling them via her site. 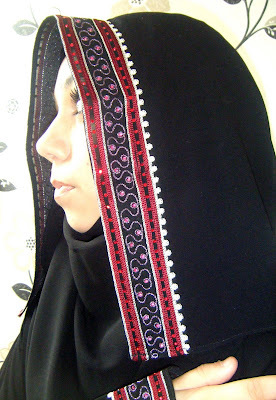 I love the colourful trims on the abayas and matching shaylas; check out the blog to see lots more! wow... these are so gorgeous!!! Simply WOW! Subhanallah! Really beautiful. I have one that looks nearly the same as the first pic but in grey. Bought it from Makkah. Mashallah they are lovely, thanks for sharing... they are so lovely. Khaleeji style abayas are so beautiful. I always feel like true quality in clothing comes from the detail work, and Khaleeji abayas always have some of the most beautiful detailing. Thanks for posting this. I'm going to pop over to their website right now! The one with a blue trim- lovely. Had a bad day, and came here to get my dose of beauty here. i really like the two in the middle, perhaps Ill try to make my own copies. i love the first two! 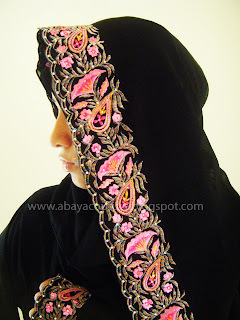 i think i may just get some embroidered lace strips and sew them onto a black hijab to get the same look. it would be easy to make.